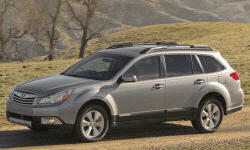 Subaru Outback Powertrain Performance Pros and Cons | Page 1 of 2 | Why Not This Car? The four cylinder engine provides barely adequate performance. I have owned and driven 2013 Honda CR-V four cylinder and Honda Accord four cylinder models from model years 2006, 2008, 2014 and 2016 that offer far better acceleration. It generally drives very nicely, but it does feel underpowered at times. The 4 cyl is adequate for the mountains. I can keep it under 3000 rpm and climb anything at highway speeds of 65 or 70 mph. I don't trust it for quick passing though. The 3.6R has plenty of power and yet gives great gas mileage. The 3.6 was a fantastic engine for this vehicle, the 2.5 was merely adequate. The O7 XT is equiped with a turbo charger,the engine response is smooth. The engine has more than enough power for the size of the car. Compared to an Audi A4 or an Audi Allroad the power is greater than or equal to those cars. Plenty of power, if you get it up to 4k rpm. No understeer or oversteer thanks to AWD and very winter capable. The road to my house has 8% to 10% grades and the Outback handled the grades with no problem even when the snow was packed and icy. The only car in its price range with true AWD-60/40 rear/front power split. Prefer the drivetrain to the more fuel efficient 4 cylinder and the hated CVT. 3-litre 6-cylinder engine provides ample performance in all conditions, is unbelievably smooth and quite (unlike a 2.5L 4-cylinder). Best Subaru mill in ages. Sealed-for-life timing chain means no expensive T-belt swap job every 60-100 kmiles. Non-turbo is quite slow even in unloaded vehicle. For the price, there were better options. Auto trans model was only 4 speed, not particularly well-matched to engine power and weight of vehicle.